Bro. Eli Tells Brazilian Pastor on Debate: Be Biblical! The signature phrase “Let us read!” (“Vamos ler” in Portuguese) of Bro. 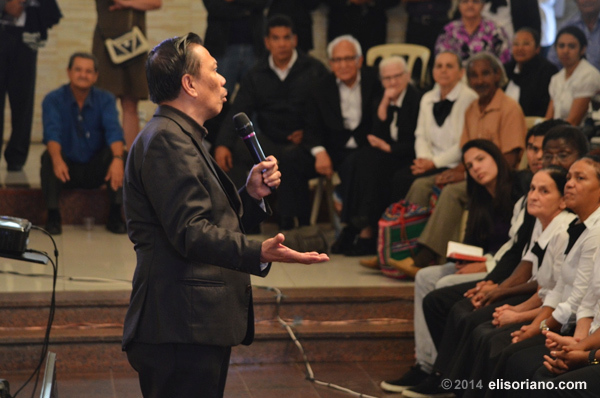 Eliseo F. Soriano reverberated in the venue of the debate in São Paulo, Brazil between the Filipino televangelist and the Brazilian Pastor Rubens Sodré on September 21 this year (Brazilian time). Bro. Eli explains his arguments in front of the live audience at São Paulo, Brazil, during his debate with the Brazilian pastor Rubens Sodré last September 21, 2014 (Brazilian time). Bro. Eli, host of the multi-language program The Old Path, challenged Mr. Sodré to be more biblical and not argue coming only from his own thinking during the debate. Bro. Eli is also the Presiding Minister of the Members Church of God International (MCGI). On a signed document, Mr. Sodre stated that he will prove that: 1) there is no more earthly sanctuary, 2) practicing divine worship no longer exists, and 3) that there is no more [need for] a priestly figure. During the first speaking time given to Bro. Eli, he questioned the stand of Sodré that there is no need for a preacher or a priestly figure. Bro. Soriano asked him what is he doing now? Is he not preaching? Sodré has in fact accounts in the Youtube and Twitter preaching in Portuguese. When he was called for his first rebuttal speech, Bro. Eli said that, unlike Rubens Sodré, he “came for a war.” However, he clarified that this war is not in a physical sense but spiritual. “Tem batalha, tem guerra, irmãos, biblicamente falando (There’s a battle, there’s war, brethren, biblically speaking),” he said. Also during the debate, Bro. Eli Soriano also proved that Christians are supposed to congregate. 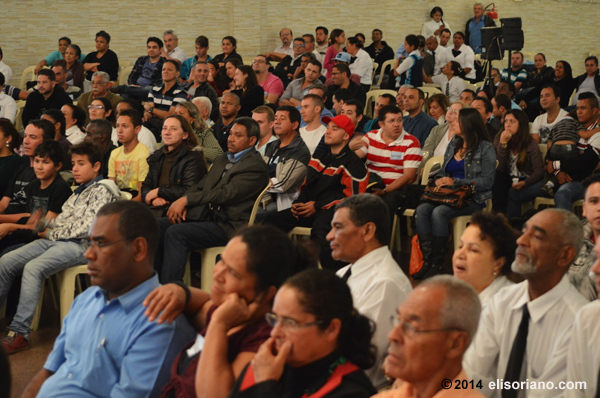 The audience at São Paulo, Brazil attentively listening to the discussion between Bro. Eli Soriano and Brazilian Pastor. “Evangelho é instrumento de Deus para congregar todos as pessoas num só corpo (The Gospel is the instrument of God to bring together all people in one body. ),” Bro. Eli said in Portuguese. According to Sodré, Christians are not supposed to assemble anymore, hence, must also shun singing songs of praises to God because such activity is not commanded to anyone. Throughout the debate, Sodré explained his arguments without using any biblical bases. Bro. Eli criticized him for arguing in a debate discussion for so long a time without reading anything from the Bible. “Vamos ler a Biblia! (Let us read the Bible! ),” Bro. Eli exclaimed. Past half way during the debate, Sodré who seemed perplexed by a continuous wave of verses from Bro. Eli suspected that the miniature microphone used by the preacher has an audio output that feeds him the verses during the course of the debate. Amused by the accusation, Bro. Eli removed the headset mic on the side of his face without any hesitation to show that no one is feeding him the verses. That moment gave a shot of jovial mood to an otherwise serious debate, stirring big cheering from the audience for the international evangelist. Sodré checked the mic himself and after making sure that it is has no audio output, has admitted he was mistaken afterwards. Observers note that this was an indirect admittance of Sodré that the knowledge of Bro. Eli on the Bible is superior. At the last speech of Bro. Soriano, he showed verses in the Bible that Christians assembled themselves together and has a preacher. Then Bro. Eli asked the crowd: “Tem congregaçao ou não (There was a congregation or not? )?” “Tem (There is! )!,” Unanimously answered by the huge crowd at the venue. Bro. Eli also gave evidences that a leader – like the Apostle Paul – is still needed. After the debate, Bro. Eli thanked everyone that attended the event, including the moderators and the time keeper. Lastly, the preacher advised Rubens Sodré to study the Bible more and he wished him to be guided. The debate that lasted for almost four hours, was also witnessed by thousands of viewers via the live Youtube streaming on its O Caminho Antigo channel. #LiveDebateWithBroEli became a popular Twitter topic that day, which was early morning in Philippine time. Audiences from different nations tweeted their comments and opinions while the debate was happening. Since the debate was mostly in Portuguese, non-speakers of the language relied on the Portuguese translation that Portuguese viewers are providing on the chatboard over the Youtube live stream page of the debate. It was during one of the Bible Expositions of the international evangelist in São Paulo when Sodré had accused Bro. Eli that the latter merely deceives people by using the Bible. To prove the Brazilian pastor wrong, Bro. Eli challenged Sodré to a debate. Before this one, the last debate of Bro. Eli in the Philippines was only about seven months ago when he faced Mr. Eusebio Catarinen last February 7, 2014. Mr. Catarinen is a pastor of a Philippine-based Church of Christ.